The plight of Dominico-Haitians — persons of Haitian ancestry, born in the Dominican Republic — was the center of attention in the Russell Senate Office Building's Caucus Room on the morning of Nov. 17 when Sonia Pierre, leader of the Movement for Dominican Women of Haitian Decent (MUDHA), was honored by the Robert F. Kennedy Memorial for her work towards securing the human rights of Dominico-Haitians within the Dominican Republic. Among the crystal chandeliers, Roman-styled columns, and high, engraved ceiling of the Caucus Room, over 300 attendees applauded a woman whose life had been characterized by the extreme poverty and social ostracism faced by many dark-skinned Dominicans of Haitian decent. Born in the migrant worker camps of the Dominican Republic (known as bateyes) in 1963, Sonia Pierre has experienced many of the social, economic, and cultural barriers that are known to exclude many Dominico-Haitians from mainstream Dominican society. Like thousands of ethnic Haitians born in the Dominican Republic, Ms. Pierre's family had previously crossed the border in search of greater work opportunities than were available to them in Haiti. While the sugar-cane fields of the Dominican Republic provided jobs to migrant workers who sought to eke out a subsistence living, such workers were viewed as both a valuable source of cheap labor to the Dominican economy and as dark-skinned undesirables who belonged to the margins of Dominican society. 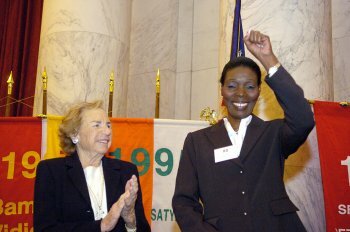 The anti-Haitian sentiment which, in the eyes of the young Sonia, characterized the treatment of ethnic Haitians throughout mainstream Dominican society has continued to this day unabated, according to Ms. Pierre, notwithstanding mounting pressure from international organizations and human rights groups. "In my country, Dominican children of Haitian descent suffer discrimination from the moment they are born," Ms. Pierre said in Spanish, her voice choked with emotion upon accepting the award. "The Dominican Constitution established that all who are born in the Dominican Republic are Dominicans. However, the authorities refuse to issue birth certificates to the children of Haitian immigrants born in the country." Despite Article 11 of the Dominican Republic's Constitution, which bestows citizenship on anyone born within the borders of the Dominican Republic, babies born to Dominico-Haitians and Haitian immigrants — many of whom had been living in the Dominican Republic for decades — are often said to be infants of those who are "in transit" and thus not eligible for citizenship, as also written in the Constitution. This widespread use of the "in transit" clause as justification for the denial of birth certificates has sparked outrage among non-governmental organizations (NGOs) and human rights groups, and has been cited in reports issued by organizations such as Amnesty International and Human Rights Watch. In Oct. 2005, a landmark ruling was made public by the Inter-American Court of Human Rights in a case brought against the Dominican government by several human rights groups including MUDHA, known as Yean and Bosico v. the Dominican Republic. In its decision, the Inter-American Court cited the systematic denial of birth certificates to ethnic Haitians as having created a class of stateless individuals within Dominican society who are routinely denied citizenship rights in the areas of health care, schooling, and employment opportunities. The Dominican government was subsequently ordered by the Court to reform its birth registration system and implement procedures which guarantee birth certificates to all children born on Dominican soil. In addition, the Court ordered schools to enroll all children, including those of immigrant Haitians, while publicly acknowledging its previous wrongdoing. In the year since the ruling, the Dominican government has done little to implement the Court's decision, and has in fact denied that racial problems even exist, explains Indira Goris, program officer at the Open Society Justice Initiative — which has worked alongside MUDHA and other non-governmental organizations to bring the case to the Court's jurisdiction. "The decision made by the Inter-American Court of Human Rights was an extremely powerful decision, the only one of its kind," said Ms. Goris, "yet the government regarded the decision as a conspiracy led by national and international NGOs, determined to besmirch the name of the DR. The Dominican government views it as a Haitian problem." A March 2006 open letter from Amnesty International to President Leonel Fernández cited reports of frequent arbitrary arrests and expulsions of Dominican-born Haitian descendents by the Dominican military. Many of those arrested are stripped of their possessions, and dropped off at the Haitian border — a nation which many deportees have no linguistic ties with, and have never even visited. According to Ms. Pierre, more than 25,000 persons have been illegally and arbitrarily expelled to Haiti in this year alone. A large portion of those deported, including women and children, have offered to human rights investigators similar stories of their being robbed, beaten, and subjected to sexual violence by military personnel. Documents and identification papers are routinely confiscated from deportees by military authorities while no word is left with remaining family members as to their loved ones whereabouts, according to a May 2005 report by the Jesuit Refugee Service. The Dominican government, however, refuses to accept the accusations made by MUDHA and other NGOs of an anti-Haitian bias in its immigration and citizenship policies. In a statement made to an international forum on Haiti in early November, Carlos Morales Troncoso, the Dominican minister of Foreign Affairs, rejected accusations of state-sanctioned mistreatment and racism against Haitian immigrants. He instead cited the access to the Dominican labor market offered to Haitian workers — both agricultural and urban — as well as the widespread use among Haitians of the Dominican Republic's public health services, where according to Mr. Troncoso, "ninety-nine percent of foreigners attended in Dominican hospitals are Haitian citizens." Indeed, relations between the Dominican Republic and Haiti have in fact improved over the last several years, with the Dominican government being one of the most vocal supporters of international aid to Haiti. In a recent interview at the Embassy of the Dominican Republic in Washington D.C., Ambassador Flavio Dario Espinal, though declining to comment directly on Sonia Pierre or the decision made by the Robert F. Kennedy Memorial to honor her this year, explained that critics of the Dominican Republic fail to see the situation that the nation is itself facing: "The Dominican Republic is a small, poor country with limited resources that faces a difficult challenge of having to absorb an illegal migration that is practically out of control as a result of a neighbor, Haiti, which has been in a permanent crisis for the last [two] decades at least. … The economic system has practically collapsed. There is a total degradation of the environment. [It is] the poorest country in the hemisphere. We have a burden, which is disproportionate in regards to the capacity of our country to absorb and deal with these issues. So what we have to say to people who will look at these issues is: just take a deep breath and see what we're facing and try to see the reality of the conditions internal to the Dominican Republic." The question of who is illegal and who is legal among ethnic Haitians, according to Ambassador Espinal, is a matter of national sovereignty, and he rejects any notion that the Yean and Bosico ruling has imposed a mandate over the Dominican Republic on matters of citizenship. On the contrary, he cites a more recent decision made by the Dominican Supreme Court: "We don't see why the Dominican Republic can't establish its own laws and its own norms regarding the acquisition of nationality. The Supreme Court has settled that, saying that only those who are born from Dominican [nationals] or even those born from foreign nationals living legally in the Dominican Republic are Dominicans, which is more open and more liberal than countries that say that only those who are born to nationals of that country are considered to be nationals of that country." Likewise, the Ambassador rejected accusations of a systematic refusal to issue birth certificates to children of ethnic Haitians, instead citing the difficulties in reaching out to those mostly poor families who have had children and not reported them. Still, he says the government acknowledges the lack of certifications as being a major crisis: "We are facing a problem. Just two weeks ago new electoral authorities were appointed. They are committed to addressing the issue of children who do not have a birth certificate [and will] try to [get] everybody to have a birth certificate and identity with a name and so on. In some regard this has impacted the population that is Haitian and who have come to this country legally, or illegally for that matter." Among Dominicans both inside and outside the Dominican Republic, issues regarding the treatment of Dominico-Haitians inspire controversy and heated debate. Commenting on the awarding of the prize to Sonia Pierre, Miguel Guerrero, a staff writer for the Santo Domingo-based newspaper El Caribe, stated in his Nov. 22 column that, "few people have had as much success in creating barriers between the two countries as Sonia Pierre. … She has created within the international community an image of the country as a racist society, similar to none other than [apartheid] South Africa." Recent comments made in Santo Domingo by U.S. Ambassador to the Dominican Republic Hans Hertell in regards to the problem of undocumented births among Dominico-Haitians prompted an immediate letter of condemnation from the Foreign Ministry, while one newspaper critiqued his comments as being a call for the relinquishing of national sovereignty. Indeed, the history of Dominican-Haitian relations is one characterized by independence movements and continued border disputes. Dominican Independence Day celebrations recall the Republic's 1844 liberation from 22 years of Haitian rule, while the threat — real or not — of a massive invasion of dark-skinned Haitians from across the border, remains embedded in the consciousness of many Dominicans. Skin color has become a routine characterization of one's own social mobility, while government and education policies promoting anti-Haitian discrimination became common under the regimes of Rafael Trujillo and Joaquin Balaguer. Ethnic stereotyping of Haitians and Dominico-Haitians remains rife throughout Dominican society. "The Dominican legislative leadership has for many years been unable to come to terms with the fact that Dominican-born children of Haitian immigrants are Dominican," said Syracuse University Professor Silvio Torres-Saillant, a leading authority on Dominican and Latino culture. "There has been a 'debate' in Congress, which has not really been a debate, but an issue that has just been allowed to lie there unresolved." Dr. Torres-Saillant views the situation not only in cultural terms, but on an economic basis as well: "[There are] segments of the economy that depend heavily on devalued Haitian labor; that includes not only Haitian immigrants but also the Dominican-born children of those immigrants. Once you acknowledge that they are Dominicans, then you have to start treating them according to labor laws and that sort of thing, and the operation becomes a bit more expensive. Ultimately, if you have people living outside the contours of the Constitution, they are a valuable reserve of labor that could be used at will." A supporter and admirer of Sonia Pierre, Dr. Torres-Saillant is quick to defend her against charges of stirring up ethnic tensions: "She is not speaking for Haitians. She is trying to get her country, the Dominican Republic, to live up to its creed. If I was to characterize Sonia's work, I'd say she is the most authentic Dominican that we have in contemporary Dominican society because she has done the most and suffered the most to get the country to comply with some basics of justice and equality in the country. When Dominican society leaves a segment of the population unattended, dehumanized, and marginalized by denying it the basics of its legal existence, the country is doing it to itself. Therefore it is harming itself. When Sonia is defending the marginalized segment of the population, she is actually doing us a great favor. She is trying to keep us honest. If we follow her lead, I think we are going to be a better country." The Robert F. Kennedy Memorial's annual Human Rights Award focuses on grassroots organizations within both the United States and the developing world that are said to work towards fulfilling Robert F. Kennedy's vision of human rights and social justice for all. Previous recipients have included Stephen Bradberry of the Association of Community Organizations for Reform Now in New Orleans, and Delphine Djiraibe of the Chad-based Association for the Promotion and Defense of Human Rights.